The China smartphone company Xiaomi has unveiled its new smartphone Mi 4S with fingerprint scanner on Wednesday at an event in Beijing. Mi 4S will go on sale from March 1 in China and will be priced at CNY 1699 (Rs.18000). The Mi 4S comes with a fingerprint scanner at its back panel. It runs on MIUI 7 based on Android v6. The processor is powered by Qualcomm Snapdragon 808 paired with Adreno 418 GPU. One advantage that Mi 4S has over other versions is the microSD expansion. The camera is supported by dual-tone LED flash and PDAF along with infrared sensor. 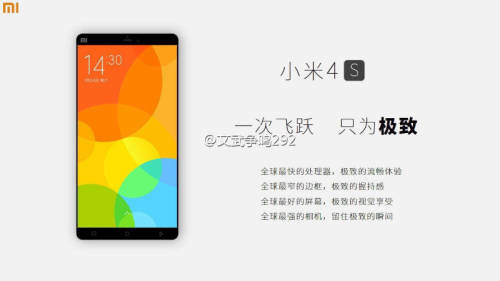 The Mi 4S supports 4G LTE, 3G, Wi-Fi 802.11 b/g/n/ac, Bluetooth, GPS, and packs USB Type-C. The non-removable battery is charged by Qualcomm’s Quick Charge 2.0 technology. Mi 4S comes in beautiful black, white, gold and purple colours. It also supports the basic features like 3G, 4G LTE, Wifi, Bluettoth and GPS. After Beijing, the mobile is waiting to be unveiled at Barcelona. Previous ArticleWould you buy Freedom 251?